Jeff For Banks: Uncle Sam: Get out of my house! Freddie Mac posted a $4.5 billion fourth quarter profit. Fannie Mae did not yet report but made $1.8 billion in the third quarter. So our Government Sponsored Enterprises (GSEs) are minting over $25 billion to their owners... Uncle Sam. Folks, revenue to the government is like crack. Congress won't be taking up GSE reform anytime soon. This poses a challenge for bankers. 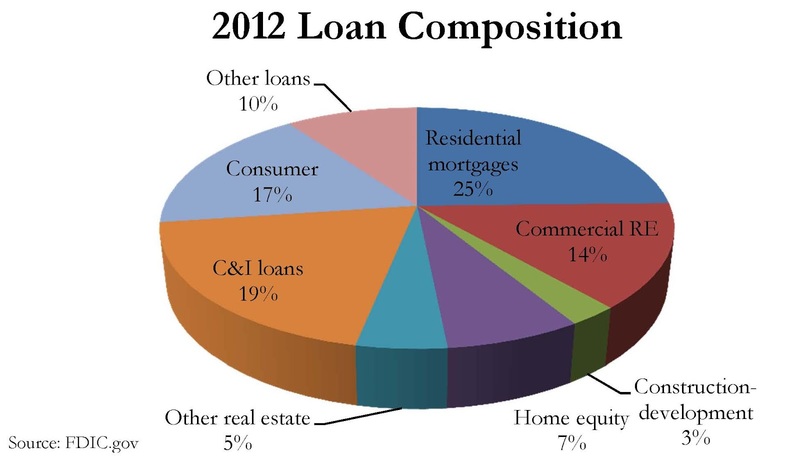 Twenty five percent of our loans are in residential mortgages (see chart). Eighty percent of mortgage originations currently pass through the GSEs. In other words, Uncle Sam owns the mortgage market and dictates its terms. Ever heard of a QM (qualified mortgage)? I would not call myself a libertarian because there are legitimate reasons for the government to participate in free markets. When the payoff is long term, such as drug research, comes to mind. But residential mortgages are not the same as the cure for pleuropulmonary blastoma. The market is fairly mature. FHFA (regulator for the GSEs) Director Edward DeMarco recognizes this and is working on developing a sustainable mortgage trading platform that can eventually be in private hands. Mortgages can be done by banks, credit unions, and the shadow banking system, without Uncle Sam's assistance. If you believe what I say is true, and perhaps our Congress finds religion to make it so, there will be changes. Some of these changes will not benefit consumers in the short term. Mainly, we are likely to see a decline in the number of 30-year mortgages. Now, I have a 30-year mortgage. Who wouldn't with rates so low? But, truth be told, there is no way a financial institution (FI) can find 30-year funding. I understand that the "average" mortgage loan lasts seven or eight years because people move. And that there is some cash flow to the FI because the loan amortizes. But there is no seven year funding FIs can tap either. If the mortgage market became more private, the 5-1 or 7-1 ARM would assume a higher perch. This is more palatable to FI risk managers and would allow for them to put more of these loans on their books. If booking the loans, they don't have to worry about the tail risk and all of the other bad things that can happen as a result of government intervention and QMs. I don't believe 30-year mortgages would go away. Their would still be a secondary market with private investors to purchase pools of mortgages. Additionally, FIs may determine to book some 30-years, and to accept the interest rate risk or hedge it. But the 30-year will begin to be priced to market, instead of artificially low because of all the government interference. The end result will be a resurgence of local FIs willing to lend and book their customers residential mortgages. There will be more choices for borrowers. And yes, borrowers will more frequently have to accept interest rate resets sooner than 30 years out. How do you think FIs can more fully participate in residential mortgage lending?